A stable is an excellent place for your horses to live and play in, but a lot of planning goes into, or should go into, its construction. If you are planning on building a new set of stables, then flooring is one of the most important factors you should consider because it is vital to the health of your animals. The two major kinds of flooring are those that are hard and those that are soft, and each have subcategories underneath them. Hard floors are popular for stables today because they are generally easier to clean and are strong and durable, being able to withstand the pressure of being constantly walked on. Concrete and hardwood are the two most common hard floors and have the properties that you’d want for your stable flooring. However, you should also be aware that hard floors may hurt the horses’ legs and hooves over time, so rubber mats should be utilised to prevent this damage. Sand and certain types of gravel are also popular options for stable flooring because they are softer than others. This prevents damage to the bodies of your animals and does not require the use of rubber mats, which is more cost efficient and healthier for the horses in the long run. The main disadvantage of softer flooring is that they are harder to clean since they are not evenly surfaced. A good option is asphalt since it is much easier for the horses’ legs. It is also also slip-resistant, though it loses this property slightly over time. When building any stables or sheds for your Perth home or ranch, all parts of the building must be considered. Flooring, which can be hard or soft, is one of the most important aspects to take into account and plays a big role in the overall health of your horses. 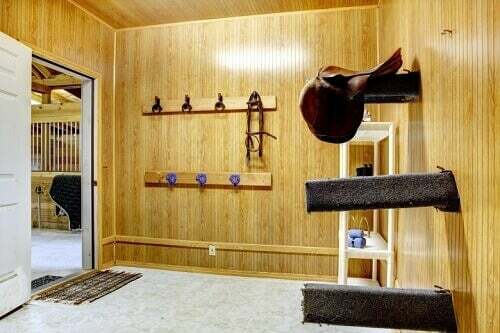 To learn more about flooring and different stable building options, call 1300 778 628.